The letters page – every letter published wins a year’s subscription to the magazine and the star letter wins a skin care set worth £64. All the letters referred to previous items that had appeared in the magazine. Each month the letters page also features a poem. In June’s issue this was written by a man in praise of his wife. The Home life page ‘is your chance to pass on good ideas for the benefit of other Prima readers and, in doing so, encourage the highest quality service and great value for everyone’. Each contribution to the page receives £25. In June’s issue the contributions included a reader’s favourite shop, a picture of grandchildren, a suggestion for a day out and a couple of product recommendations. The Readers’ Kitchen page wants your recipes and tips plus recommendations for a favourite cafe, food shop or gadget. Recipes receive a year’s subscription to the magazine, tips and cafe or other recommendations earn £25. Picture Perfect – £25 for each photo printed on this page. June’s page is a Father’s Day Special and each picture includes a dad with young children. Do you have a winning story? – this page asks for 400 word stories. Reading the June winners, it looks like either fiction or real life experiences can be submitted. 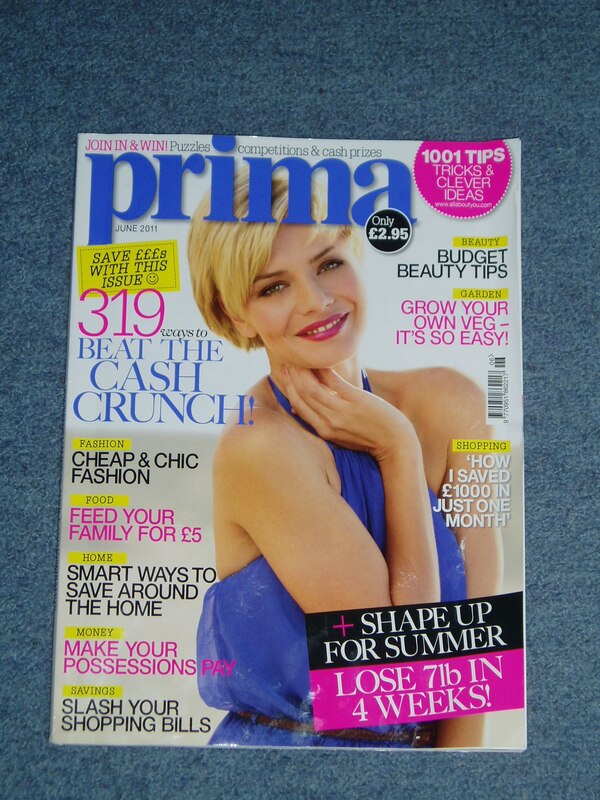 The winner receives £200 and two runners-up each receive a year’s subscription to Prima. Reader’s tips are dotted throughout the magazine – each one receiving £25. Plus the best tip receives £50. Wise Words – each month Prima is looking for wise words on a set theme. The June issue sets the theme ‘The best things in life are free, such as…’ and offers £25 for those chosen. Why not nip out and buy a copy of the magazine? Study the style of your chosen section and then compose your contribution to fit. If you don’t try you won’t succeed! And don’t forget to sign up for a free email subscription to this blog if you want a chance to be the next home for my World Book Night books. This entry was posted on May 12, 2011, 11:00 am and is filed under Markets. You can follow any responses to this entry through RSS 2.0. You can leave a response, or trackback from your own site. Thanks for this information. Sounds like a good opportunity for sending in. I found your list of categories, with illustrations of the subject material, very helpful. Intend to buy Prima to see for myself how I can contribute and perhaps see my name in print again! Sounds really good. And 200 pounds for 400 words is reasonable. I should write a few short stories for these sort of things. Thanks for this, I’m off out immmediately to grab a copy. A tip I got from my chiropodist, and has worked for me, use Vicks Vaporub on or under the offending nail at bedtime. What nail problem does this fix, Liz? Hi Janet – that sounds like a good idea. However, I’m not directly connected with Prima magazine, you need to email this useful tip direct to the magazine. The email address will be somewhere within the magazine. Good Luck with it!